The murderer is right in this room, sitting at this table. You may serve the fish. 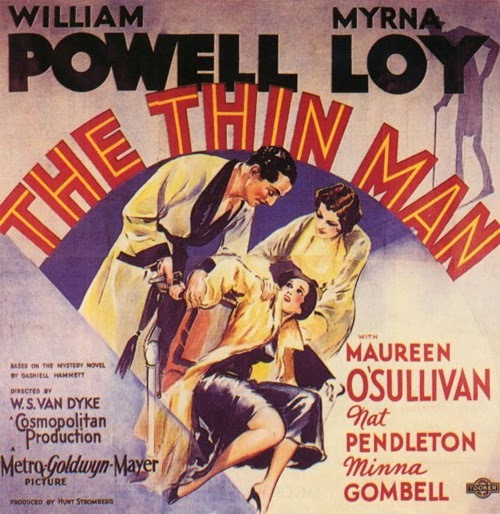 I’ve watched The Thin Man before, but so long ago I’d forgotten much of it. So it was a surprise and delight to see such a consistently irresponsible depiction of consequence-free drinking. 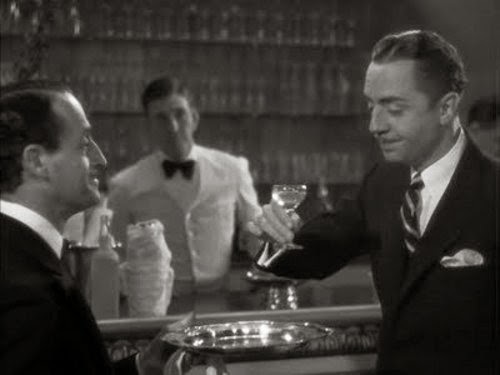 Not because I’m particularly prone to excessive indulgence in all things that are bad for one (or because I’m a raging alcoholic) and so identify with William Powell’s tipsy Nick, or because I’m a rep for the alcohol industry. But because it’s so different, confounding expectations of this kind of film from this era (and, let’s face it, no one would present drinking this way today). This outlandish helps to make the movie the very funny. This isn’t a picture with a kind of teenage “It’s so daring” attitude, and thankfully it’s a far cry from the opposite end of the spectrum’s Leaving Las Vegas. 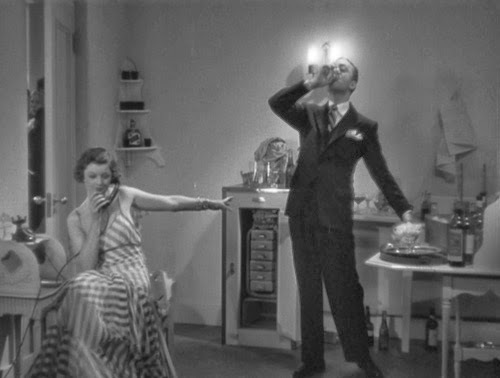 Rather, it possesses a flippantly cheerful outlook, and the party-loving Nick and Nora (Myrna Loy) are wholly functional. 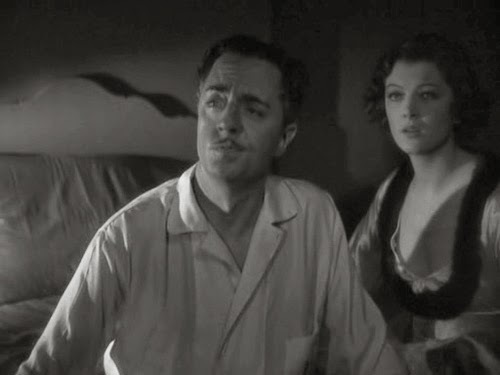 I’m also doing it something of an injustice by focussing on this element off the bat; The Thin Man’s greatest attribute is actually the amazing chemistry and repartee between (ex-) private detective (not the titular character, at least not at this point; that’s the missing Wynant) and his wife. The actual mystery is very much second fiddle, which is not to say that it doesn’t have its pleasures. 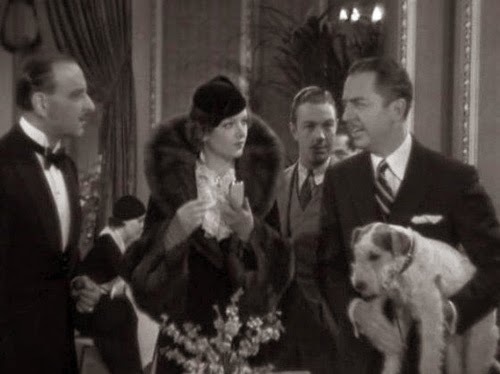 There are two things to know that help give context to The Thin Man (not that you really need any initiation to enjoy and find it highly amusing, any more than you do a Marx Brothers movie). One is that Prohibition had finally ended its decade-plus rein in the US the previous year, so you’ll have to excuse Nick if he’s in a somewhat unrestrained and jubilant mood. He just can’t put a cap on the bottle. 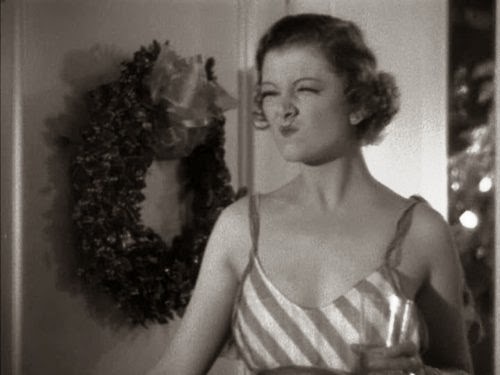 The other factor is the censorious and highly prescriptive Hays Code (although it arguably resulted in the kind of creativity that only comes through limitation in many cases, not that that’s to justify it or anything), which had been introduced in 1930 but was only just receiving proper application in the year The Thin Man came out. Thus it’s a picture that rests on something of a cusp. 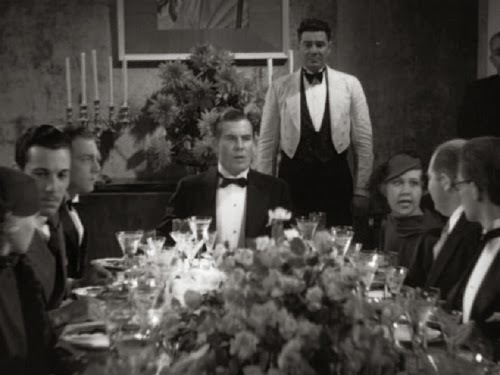 There are a lot of bawdy gags and innuendo-laced lines in The Thin Man. They deserve a paragraph or two all to themselves. Sure, Nick and Nora sleep in separate beds (at least until the final scene) but there is otherwise very little that is off limits. Adapted from Dashiel Hammett’s novel by Albert Hackett and Frances Goodrich (a husband and wife writing team, they would deliver several of the sequels, as well as It’s A Wonderful Life; it’s hard not to conclude that something of their own relationship must have finished up in the feisty interplay between the two leads) and solidly if unremarkably directed by W.S. Van Dyke (never bound for great things, his directing career was nearly two decades old when he took this gig; he would also return for a number of the follow-ups), it was shot in a mere 12 days. If that no-frills approach is evident in the stagey set-ups, it’s more than defused by the bubbly bonhomie of the leading duo. Or should I say trio, as their faithful dog Astor (at the time the canine actor was called Skippy; the magnificent mutt would go on to appear in Bringing Up Baby) is an intrinsic part of the sleuthing team. He’s also the likely inspiration for the bow-wow in The Artist. It’s a sign of the secondary nature of the titular type that we probably don’t recall exactly what he is up to before he goes missing; he’s an inventor, and he has his fingers on a new smelting process. He’s also, all evidence to the contrary, something of a flighty fellow. He has an ex-wife, a floozy, and hangers-on attempting to make a dime off him left right and centre. It’s also snowing, as it three months later (Christmas) when the majority of the movie is set. Which makes it something of a period of prolonged chills. All the more need for a beer (or gin) jacket. Nick used to be a detective, but since he married he’s given up the trade. He was also once engaged by Wynant (William Henry) on a case, making him an obvious choice for a request for help when Wynant’s daughter (engaged to be married) bumps into him. What follows is a succession of semi-sloshed encounters with gold-digging ex-wives and their fancy men, less than brilliant police officers and an assortment of lowlifes. None of whom Nick treats with any more or less respect than the other. His lopsided outlook on the world is – and this is the precious thing in an industry generally reproved for its less than stellar female roles – matched pound for pound and witticism for witticism by his better half. The one big concern over the prospective Johnny Depp version is not Depp (I’m afraid I’m a defender, even at his most indulgently Burtonesque), or the involvement of Rob Marshall, or that they’re remaking it at all (well, why not? ), but that if they don’t nail the female lead the whole thing unravels. Johnny can do the incorrigible drunk act in his sleep, but it’s the chemistry and trading of quips and adoring rebukes that will see it sink or swim in a fountain of champagne. And they must be one of the big screen’s most adorable couples ever. Any trace of sentiment is bathed in a glow of badinage, so as not to seem overly concerned or invested. “I don’t care. It’s just that I’m used to you, that’s all,” says Nora, of Nick’s possibly dangerous excursion. She expresses her affection through faux-shallowness (“Oh Nicky, I love you because you know such lovely people”) but their every exchange reeks of genuine delight in each other. Nick jokes openly that he can’t possibly take the case (“I’m much too busy seeing that you don’t lose any of the money I married you for”, which includes the narrow gauge railway, lumber mill “and oh several other things”). They engage in pretend violence, trade presents like they’re big kids (Nick has a BB gun and proceeds to shoot all the balloons of the Christmas tree) and joke about how one or other might run off with someone else. Indeed, Nora is so assured of her husband’s fidelity that her nominally reactive lines are some of the best in the movie. Instead of being outraged at finding a girl in her husband’s arms she offers her a drink. And Nick’s gesture of how besotted he is with her is the absolutely marvellous description of his preferred type; “Lanky brunettes with wicked jaws”. When Nora discovers Nick is way ahead of her getting soused, she orders “Five more Martinis” to get up to speed and, after he has (bizarrely) punched her out to remove her from the line of fire, she merely complains that she didn’t get to see the action. (“There’s a girl with hair on her chest” utter the admiring cops). Reporter: Can’t you tell us anything about the case? Nick: Yes, it’s putting me way behind on my drinking. Which kind of sums up Nick’s approach to the case; it’s a distraction from the job in hand. You can see a glimmer of the Coen Brothers’ inspiration for the permanently stoned Dude in The Big Lebowski. It’s his intoxication that lends the plot its unique momentum. 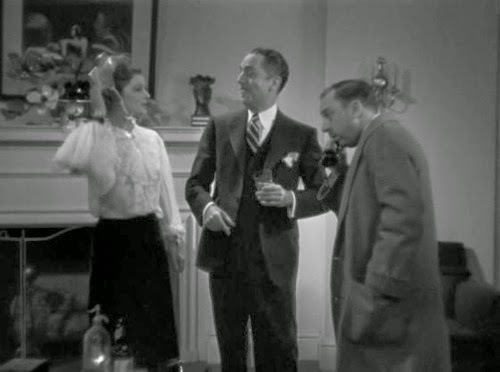 Any given reference to detective work yields consequent references to boozing (“Say, is he working on a case?”; “Yes, a case of Scotch” replies Nora). Asked why he’s in town, Nick replies “My wife’s on a bender. I’m trying to sober her up”. He greets guests in the morning with a drink, and suggests it for those who cant get to sleep. It’s also an excellent curative when afflicted by a bullet wound. He’s the kind of guy has no qualms about trying strange drinks in strange houses. Nora: I read that you were shot five times in the tabloids. The super-quick banter has something of the Marx Brothers about it, by way of screwball comedies. But it’s the gleeful innuendo that most puts one in mind of Groucho. When Nora asks about Nick’s relationship with Dorothy (Maureen O’Sullivan), he joshes that she is his daughter (“It was spring in Venice”). Some of the lines are even more overt; Gilbertt comments that his father was a sexagenarian, to which a reporter responds that they can’t put that in the papers; “You know how they are”. 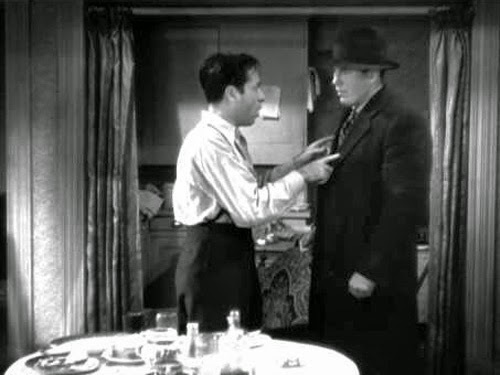 Nick spits out his drink when Nora exclaims “What’s that man doing in my drawers?” and the train tooting by, after Astor has been informed he will be occupying the top bunk, must certainly have tickled Alfred Hitchcock. This is all right on the edge, and its difficult to think The Hays Code would have accepted it a year or two later. Astor the dog, the wirehaired fox terrier, is intrinsic to Nick and Nora’s relationship, the child they can dote over without (again, very much a no-no) becoming all gooey and sentimental. Nick even introduces him before Nora to the waiter at the “gin mill” he is frequenting (“Well, you might have mentioned me first on the bill”) and Nora lets slip her concern to the paltry pooch (“If you let anything happen to him, you’ll never wag that tail again”). Wonderfully, he is given a fire hydrant as a Christmas present (It’s implied he pees all over the tree) and crucially he leads Nick to the spot where crucial evidence lies. He also makes an unlikely vicious beast (“Don’t make a move or that dog will tear you to shreds”). As susceptible as we all are to very cute animals, it appears that the popularity of the pooch (and hounds of the same variety) led to over-breeding. The rest of the cast is interesting varied. O’Sullivan is your standard winsome love interest of your standard rugged hero (Henry Wadsworth), neither of whom have much to do after the first 10 minutes at which point Nick enters the picture. But later there’s another interesting pre-Hays story beat where Dorothy decides to fall into the ways of sin and degradation; she arrives at the climactic dinner party with some guy she’s just picked up at the station. O’Sullivan went on to play Johnny Weissmuller’s Jane, and mother Mia Farrow. 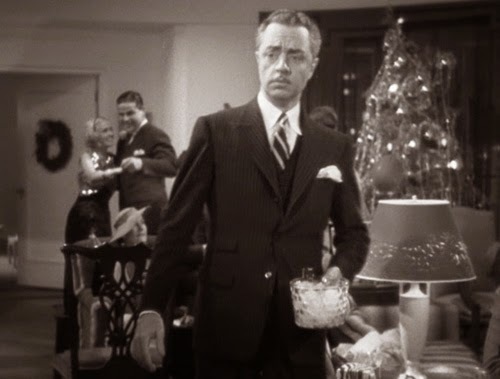 William Henry makes the most of his slightly creepy role as Dorothy’s brother, an ardent Freudian (“I know I have a mother fixation”) and given to unlikely theories regarding his father’s disappearance. Mina Gombell, who doesn’t seem nearly old enough to be the mother of this brood, has the kind of striking features that wouldn’t look out of place in a Universal Horror. Cesar Romero, Burt West’s Batman’s Joker, is her fancy man. And Nat Pendleton, well-meaning blockheaded Lieutenant Guild, makes a virtue of being always several steps behind Nick. Bursting in on a confrontation between Nick and a hood that results in a gun going off, Guild comments that it’s very lucky they arrived when they did. “Yes, I might not have been shot”, replies Nick. Nick: The murderer is right in this room, sitting at this table. You may serve the fish. Also much like a Marx Brothers film, we’re given a couple of comic set pieces that throw everything into the mix. An escalating party thrown by Nick finds ever more of Wynant’s family arriving to seek an audience with the ex-detective, necessitating various meeting places in the few unoccupied spots left in the apartment. Most memorable is the Agatha Christie-but-pissed dinner feast, where Nick assembles his cast of suspects and gets to the heart of the case. 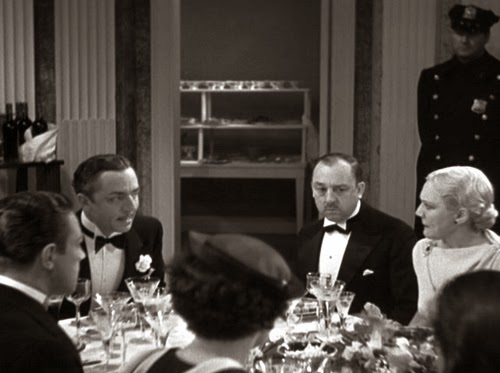 In a sense The Thin Man’s a good whodunnit as there are plenty of suspects and it really isn’t clear until the end who did what; it’s only quite obvious that the hubby is probably kaput, as the messages and phone calls from him all occur off-screen. So the only real problem with the mystery is, when you find out who it is, there’s no real impact; his simply isn’t a very interesting character or performance. Of course, for the mystery to be strong too would merely be the icing on the cake. Nora: Then why are you saying it? Nick: It’s the only way it makes sense. Nick’s run of witty one-liners and chipper disrespect for his guests is magnificent. Nothing that occurs throws him (“Er waiter, will you kindly remove that” he asks in relation to the unconscious body just laid out by Dorothy’s fiancé) and potential threats are wisecracked off (“If that knife’s missing, I’ll look for it in my back”). 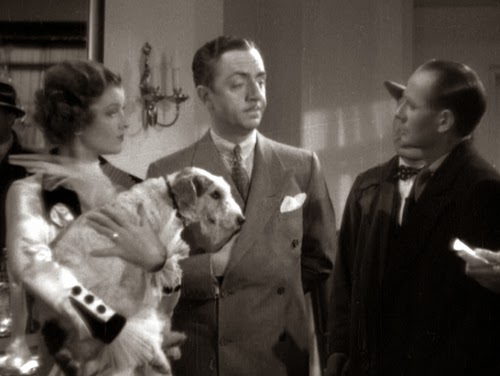 Neil Simon’s postmodern deconstruction of detective fiction in Murder by Death is redundant when The Thin Man is so self-aware (Simon even has a couple of Nick and Nora substitutes). And, as might be expected, Nick hogs the limelight but Nora walks off with the classic line (“Best dinner I ever listened to”). Those who bemoan Hollywood’s sequel affliction (and for remakes! You go Johnny!) should take note that there were five follow-ups over a span of thirteen years. Admittedly, this was a time when such behaviour was expected of B-movies; now the B-movies are A-movies. I’ll hopefully get round to visiting them all over the next few months (I think the original’s the only one I’ve seen before). Whatever my take on the series’ (invariably and inevitably) declining quality, I heartily recommend the slightly rough around the edges ribaldry of this first escapade.